Look at situations from all angles, and you will become more open. ~ Dalai Lama Want to try an interesting experiment? If you're ever bored just post something to do with ground ladders on a social media site for firefighters and get yourself some popcorn, (insert Michael Jackson "just here for the comments"meme...) It seems that this is an area where there is a great deal of separation between what many of us learned as new firefighters on the drill ground and what actually happens at fires. Everyone seems to have an opinion on what ladders we carry, how we carry them, how we throw them, where we place them, how many people we use to do it and what angle they're set at when we do. This last one is what I'd like to focus on for a little bit. It seems that you can't talk about ladders without someone eventually throwing in the comment, "That ladder's not 75 degrees" or "who put that ladder up it's the wrong angle." I have a hunch many if not all of us were probably taught some version of the IFSTA formula for checking "the proper" ladder angle. We stood on the bottom rung after completing our throw and reached out to grab the rungs to "check" our angle. This was to ensure that we got the proper angle so our world didn't come crashing down on top of us or worse yet us and a victim. The question I asked myself was, 'How often do we really achieve a 70-75 degree climbing angle? Now to set this up, extension ladders are going to allow us to be more precise with our placement, thus allowing (if you so desire) a chance to grasp the 'Holy Grail' of climbing angles because of their obvious ability to adjust their height, but what about straight ladders? How often are we anywhere near the IFSTA/manufacturer recommended angle with our straight ladders that can't adjust their height? Now, before we move forward lets set some parameters for this discussion. 1.) We will spend our time discussing straight ladders placed at windows because we know we have to work with what the window height gives us. 2.) Ladders should indefinitely be placed at the window sill. Not next to the window, not above the window...at the sill. We need ladders to make access into windows, egress from windows (perhaps with victims or for FF survival) and we need to take windows for ventilation, all can and should be accomplished with the tip placed at the sill. This is all about efficiency, I want to move the ladder the least amount of times as possible. I don't want to set the ladder to the windward side of the window, vent the window then come down and have to move the ladder to the sill to leave it there for FF egress. When we perform Vent Enter Search, where is the ladder? At the sill. It shouldn't be any different when we are venting for fire attack and then leaving the ladder for FF egress. Mask up before you take the window to prevent getting glass in your face. But I want to set that ladder once, not twice or three times. Speed and efficiency wins. There should be no wasted moves on the fire ground, get your ladders to the sill. So, what we are going to discuss is straight ladders to the sill. I went out armed with an inclinometer, a 14ft, 16ft, and 20ft straight ladder, a curious mind and a willing crew. The picture below is of a 16ft and 20ft ladder set up to a 2nd story window. Part of what intrigued me about the idea of looking into what angles our ladders were really at is that I believed that we were not very good at guessing the actual angle of these ladders, meaning many people who post the comments "that's not the right angle???" can't really tell what angle the ladder is at. So ask yourself what do you think the angle is of each of these ladders in the picture below? The 20ft is 44 degrees and the 16ft is 61 degrees. How many of you were right? Or even close? Would you feel comfortable climbing that 20 ft ladder at 44 degrees? Lets look at some more examples. 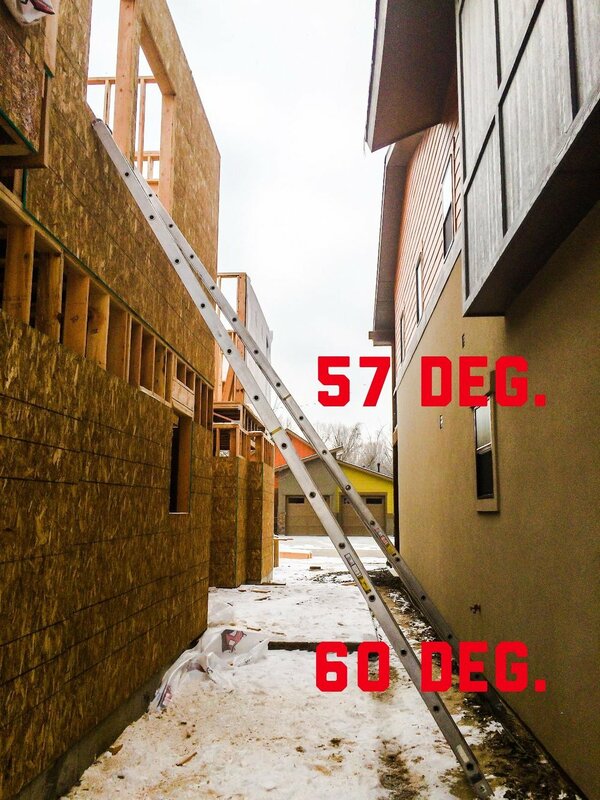 In the picture below we have a 20ft at 57 degrees and a 16ft at 60 degrees. Not bad, and there are many people that have said 60 degrees is a rescue angle. And finally a 14ft to a residential attic access. 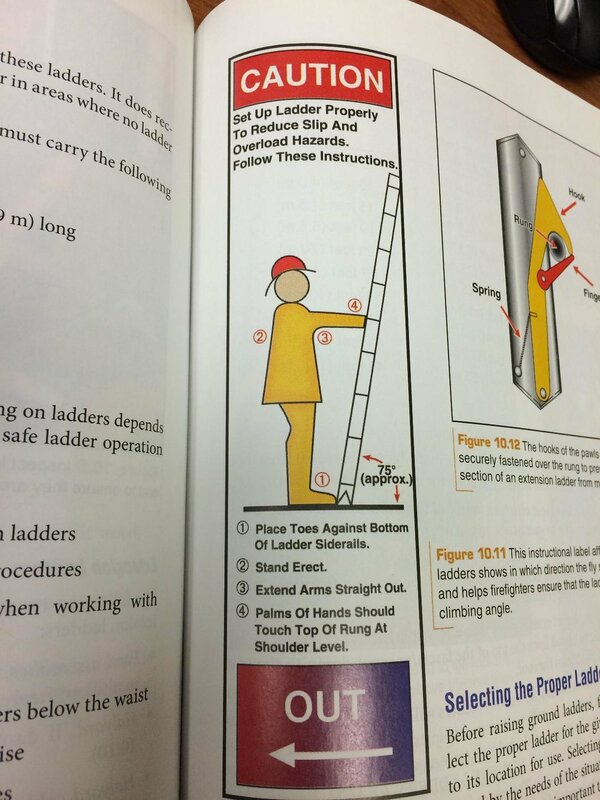 Some of you might be thinking that I only included pics of ladders that support my argument regarding ladder angles. 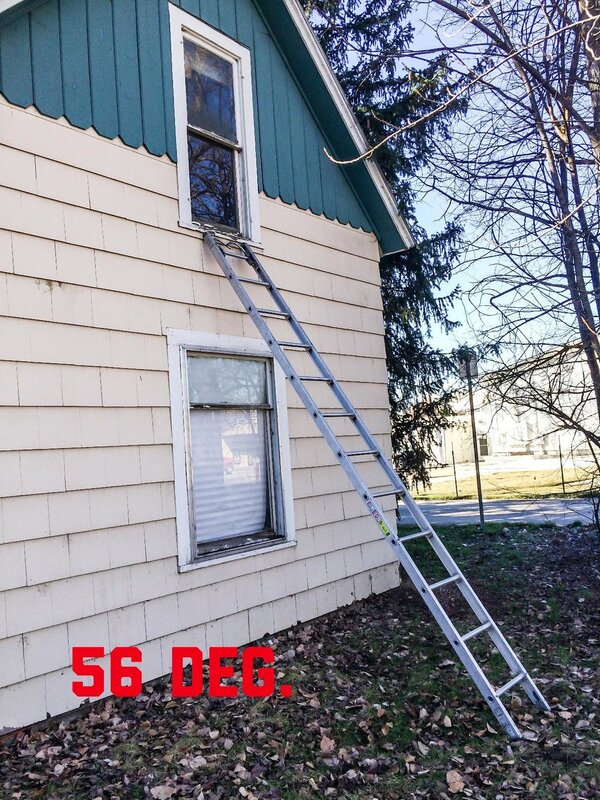 But the reality is that with our 3 different lengths of straight ladders, 14ft, 16ft, and 20ft we did not hit 70 degrees to the sill one time, not ONE TIME. Obviously this is just a small sampling of the different building set ups we will encounter but the point remains the same, just because a book says or even the manufacturer says 75 degrees is the angle these ladders should be climbed at, doesn't mean that is at all what your going to encounter on the streets using these ladders in real applications. People are rescued on a daily basis using ground ladders, and how many of the firefighters making those rescues were at all concerned with the angle of that ladder when it got to the sill? If the angle is sketchy we should be disciplined enough to know when we do and don't need someone footing the ladder for us. These pictures show that a firefighter can climb a ladder at 30 and 40 degrees with a single firefighter footing the ladder with one foot. We're often just one foot away from an effective angle. In addition most straight ladders come with hooks on at least one end that we can hook into a window sill and climb the ladder without someone footing it...at any angle. This is not a technique that I use often, but does have its time and place. When faced with severe shallow angles on ladders that are going to be left unattended this is often a viable option. Normally I would use this on ladders that are in place for FF egress in windows that have already been taken. 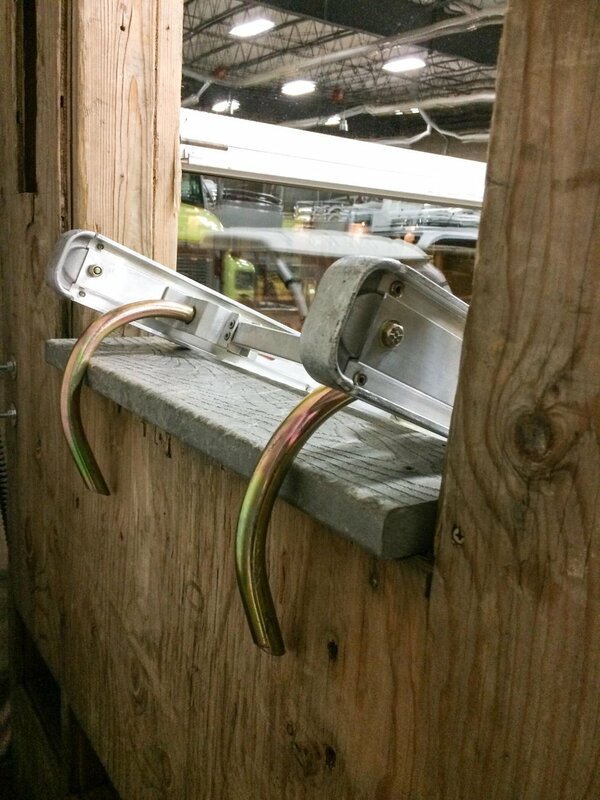 This allows for a ladder to be anchored for egress, especially when the ladder is not on dirt or grass but on concrete or asphalt without a FF attending to it. 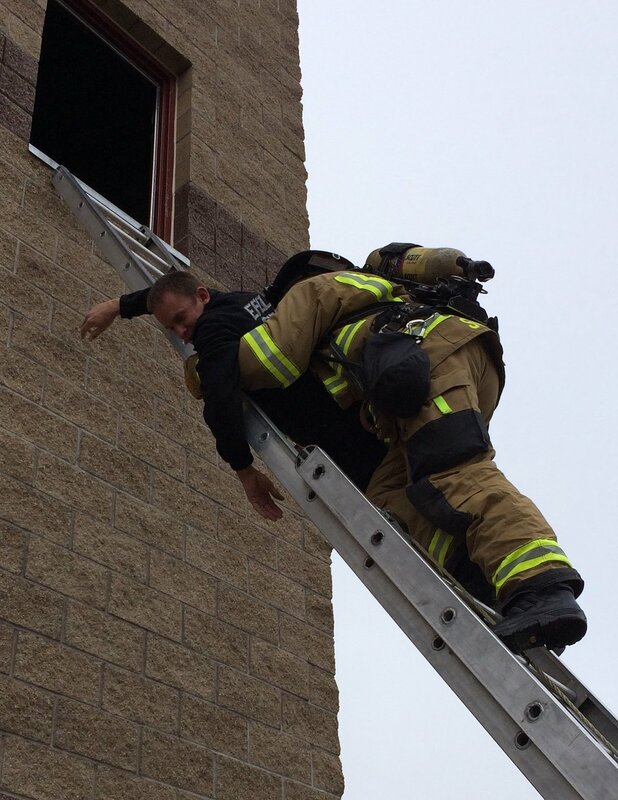 The disadvantages for using the hooks for rescue is that you've now created a step with the tip of the ladder in the window that you will have to get a victim up and over. Not all sills will be narrow enough for the hooks to bite over but that is something that won't be found out until the moment of truth. If you are manpower deficient and don't have the extra body to foot the ladder, this can be a great option especially when the ladder is on hard surfaces. In closing, we should all be striving to work in a place with a strong ladder culture. Don't make excuses for not getting work done because of something written in a book, that someone told you was the way it HAD to be done. Ask yourself what ladders do I have and how to do they stand up against the buildings on my Job? Then go bang a ladder against anything that has a window and see for yourself what the reality of your climbing angles are. You might be like most, who quickly realize the book answer of 75 degrees doesn't apply to them in 95% of their scenarios and suddenly become aware that they weren't quite as prepared for the working fire ground as they thought. Which is a humbling but powerful gift when received by the right person. Get those ladders up, because a victim can't be brought down a ladder that isn't there and a firefighter can't bail out a ladder that's still on the rig. Don't use the excuse angle, make a rescue angle.